The Nissan City Hub will be fully dedicated to an exclusive and immersive experience that puts consumers at the heart of Nissan’s vision for tomorrow’s mobility. According to a Bain & Company 2017 study, 50% of car purchases start online and 60% of consumers have decided on the brand, model and price before having set foot in a dealership. To reconnect with consumers’ new demands and consumption habits, Nissan’s development of its future retail distribution strategy is deeply anchored in a new, seamless and integrated model that leverages both the local knowledge and strong foothold of dealerships with the new opportunities created with digital. This reinvented distribution network aims to deliver an industry-leading customer experience and exceed consumer expectations with an improved online and offline ecosystem based on new formats and new technologies, giving them full control of their purchasing process and supporting them along the journey thanks to product experts and partner dealers. The Nissan City Hub is a revolutionary new approach that integrates a digital ecosystem with an eye-catching concept store at Vélizy 2 shopping centre. Offering a completely new customer experience, unique in the automotive industry, the Nissan City Hub is a bustling destination with bold ambitions: 88 m2 of screen surface and displays, 5 spots dedicated to model test-drive handovers and a planned expansion after the fall of 2019. New e-commerce solutions offered to consumers at Nissan City Hub have been developed to ensure ease of use and multiple opportunities to personify and purchase cars directly online, with a “no-pressure” approach. With just a few clicks, it’s never been easier to buy a Nissan LEAF or QASHQAI. Customers are greeted by Nissan Intelligent Mobility Ambassadors, a team from diverse retailing backgrounds such as creative arts, music and new technologies, to lead this new customer experience. Nissan Intelligent Mobility takes centre stage with its icon, the Nissan LEAF, Europe’s best-selling electric car, and new technologies such as ProPILOT, which gives the driver more confidence behind the wheel. 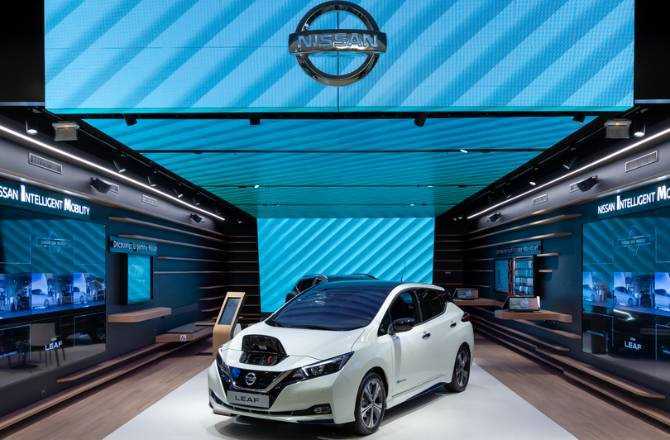 After the planned expansion, Nissan City Hub will also be the opportunity for consumers to discover xStorage Home, an innovative energy storage solution, that uses new and second-life Nissan EV batteries, and France’s first electric vehicle quick charging network. To go further, Nissan City Hub customers will have the possibility to have their cars delivered in Vélizy, or in another Groupe Altaïr dealership, or even at home. This new pillar in the Nissan’ future retail distribution strategy is setting the path for the expansion of a new, unique commercial vision that aims to be deployed in other similar metropolitan spots, such as Berlin, Tokyo or Shanghai.